Crocodiles are protected in Australia. These impressive, if dangerous, animals are icons of the north. But it wasn’t always so. 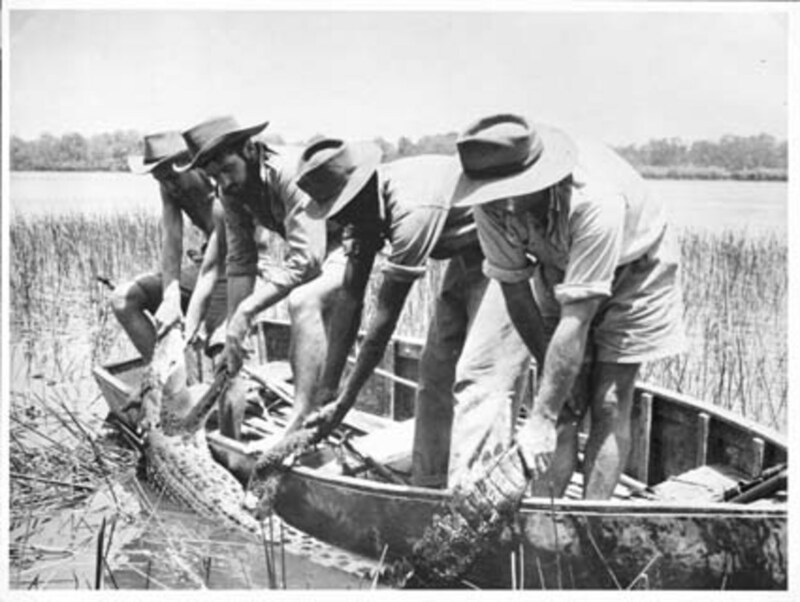 Crocodiles used to be hunted freely in northern Australia, an activity that led to their decline and eventual protection. There have been calls to cull crocodiles to improve safety, but experts argue that this will make little difference to the risk. Besides, crocodiles are already sustainably farmed for leather products. However, there are also calls – for instance, from federal MP Bob Katter – to allow crocodiles to be shot for safari. Selling hunting licences worth thousands of dollars to rich shooters, the argument goes, could provide vital income. But this ignores Australia’s history of crocodile hunting. Crocodile hunters in the Northern Territory. Immediately after the second world war, .303 rifles were widely available and were capable of reliably killing crocodiles. 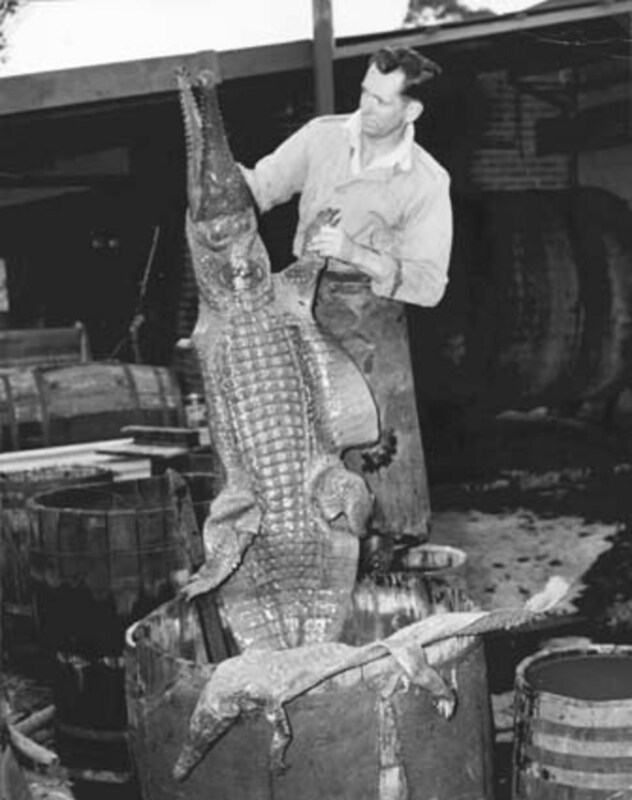 Crocodile skins suddenly increased in value — the Australian crocodile-hunting boom was the result. The boom attracted hunters from southern Australia, including new immigrants. Some made significant amounts of money as the price of crocodile skins rose, but the prospect of adventure was often a far more significant lure. For many, coming north to hunt crocodiles was a working holiday combined with a boy’s own adventure. It was also an opportunity for men restless from the war to put off settling back into domesticity. That mood of adventure was captured in a 1956 home movie, aptly titled Northern Safari. Shown as a feature film, it packed cinemas in Australia and overseas. Northern Safari documented a family trip north and showed the accessibility of hunting in northern Australia to anyone with the time and practical skills to get there. In addition to this accessible but rugged style of hunting, some postwar entrepreneurs began to offer organised hunting. Aimed at people with more money, less time and a greater desire for comfort, the commercial Australian safari was born. 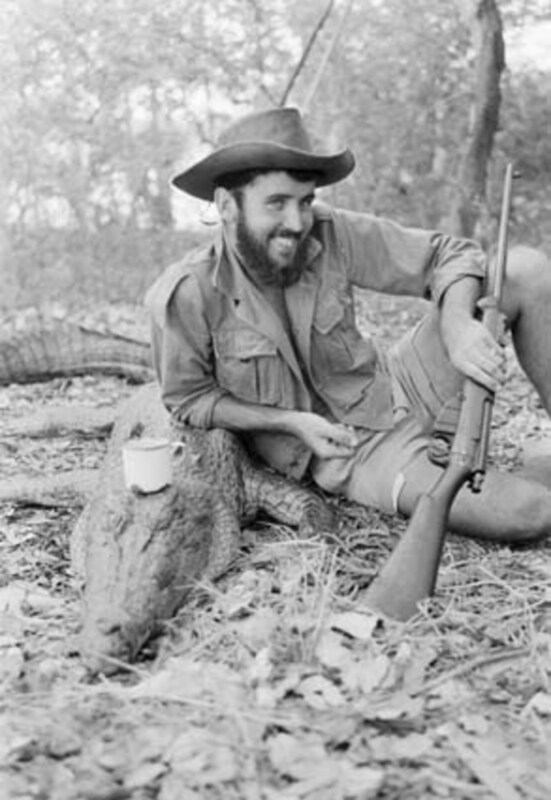 The Australian Crocodile Shooters’ Club actively promoted safari cruises to hunters who wished to shoot in luxury. 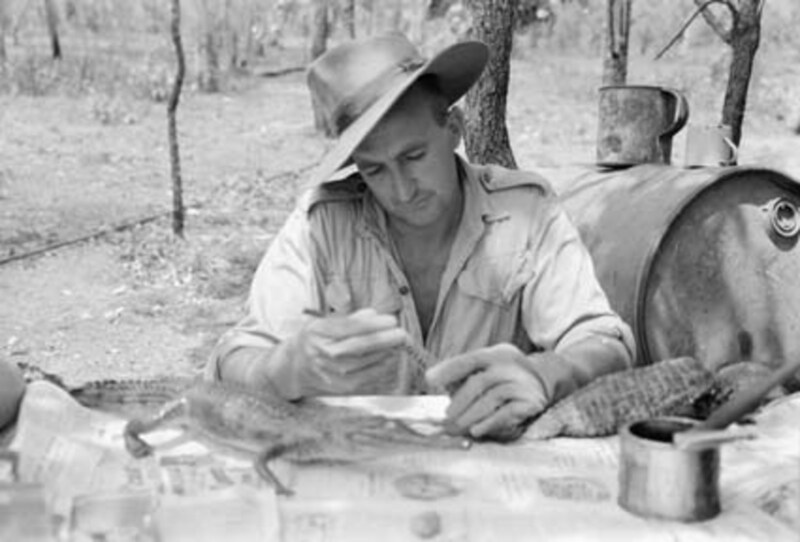 In 1952 it established one of Australia’s first safari camps in the Gulf of Carpentaria. However, the Australian safari at this time was less exclusive than the original African version. While expensive, hunters might subsidise their holidays through the sale of crocodile skins – and the services and amenities provided could not be described as truly luxurious. Nevertheless, the Australian safari has evolved since the ban on crocodile hunting and has taken its place among international safari organisations. Safari operations cater to visiting sportsmen by providing access to introduced species and game fish. The Australian experience is one of many such distinct experiences promoted at the annual Safari Club International convention. An NT croc hunter in 1949. New Zealand provides an example of how such tourist trophy hunting operates. Based on privately owned red deer estates, some hunting providers sell clients the right to hunt an animal selected for its probable value under the Safari Club International scoring system. Estate deer are bred for their trophy value and their antlers command scores unmatched by red deer found on public land. Access to them is limited and the cost of hunting one of the highest-scoring stags is more than NZ$20,000. Estate deer hunting is largely invisible to ordinary New Zealand hunters. Despite the enthusiasm of proponents, there is widespread unease about the killing of big game. As with the red deer industry in New Zealand, the safari industry in Australia at present depends on introduced species of game, and so avoids controversy. Overseas the death of Cecil the lion brought public unease about big game hunting into the open, as did the participation of touring New Zealand rugby players in a legal hunt in South Africa. Privileged access to native game and the killing of large native animals for sport has been made more visible by the sharing of images via the internet, and that visibility has demonstrated widespread public unease with the safari. So who gets to hunt? Scientific commentators agree that crocodile culling is unlikely to decrease the number or severity of crocodile attacks on humans in Australia. Neither is hunting crocodiles in Australia about managing an introduced pest. 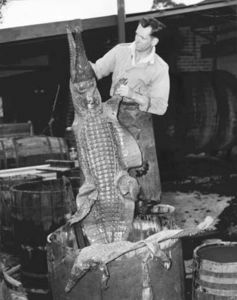 A croc hunter stuffing crocodiles for sale in 1949. Instead, it is desirable because of the adventure involved, because for some hunting provides a meaningful connection with nature and because for others killing large animals brings prestige. These motivations aren’t being discussed. If the crocodile safari were to be re-established in Australia it wouldn’t be the freely available experience it once was. Modern safari hunting is expensive and the preserve of only a few. 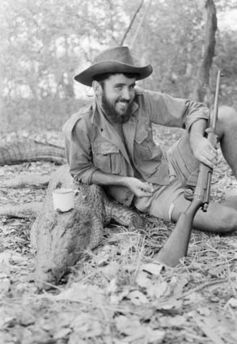 Australians need to consider if they really wish to entice elite international hunters to Australia using a native species (even one as unlovable as the saltwater crocodile) as prey.